Our Central Track Staff Picks For Top International Releases. At least on the music end of things, 2015 has proven itself to be a hell of a year. Really, we faced a battering ram of great tunes all year long. Kendrick Lamar released his magnum opus tour de force, To Pimp a Butterfly. Kacey Musgraves released a Grammy-nominated follow up to her Grammy-nominated debut. Future assaulted us with a gazillion projects that accent his depravity to numb his pain. Tame Impala released Currents, which solidified that band as one of the most gifted, talented and consistent rock acts going. And here's the thing: Those are just a few of the names you'll see pop up more than once among the differing tastes seen here in this collection of our Central Track staff's favorite albums of 2015. H. Drew Blackburn (Associate Editor). These are my favorite albums of the year. I don't have much to say here except for the fact that Kendrick Lamar released this year what is probably my favorite album of all time. It's a masterpiece in so many ways. Also, Courtney Barnett, who I saw live three times between November 2014 and May 2015 is a goddamn genius and a brilliant writer. I accidentally became a fan of hers after stumbling across her “Lance Jr.” song on Bandcamp three years ago, and I am very pleased to have watched her ascend to stardom. She is deserves it. Shout out to Courtney Barnett. 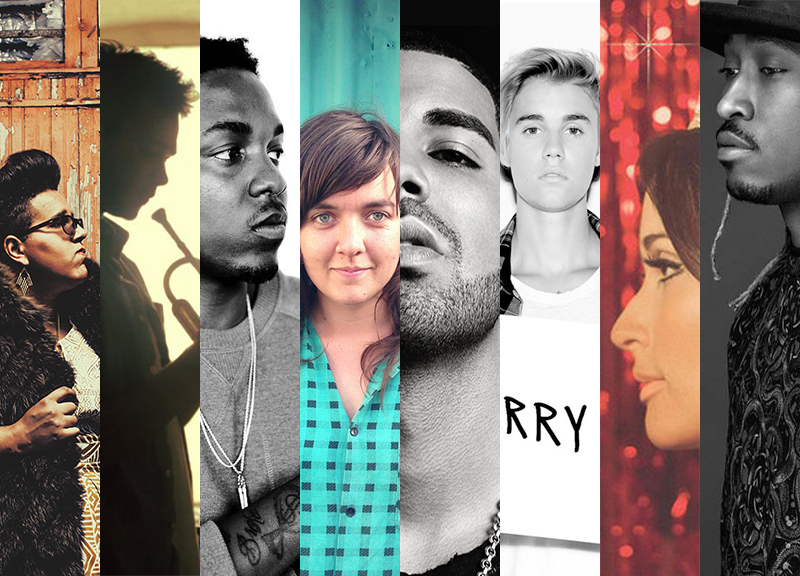 For the first time in about a decade, I wasn't necessarily slaving over just music in 2015. And that makes this annual year-end list-making effort a bit of a weird task this time around: On the one hand, I fully admit that I've been playing a lot of catch-up of late and only discovered in the last few weeks some months-old greatness; on the other hand, in spite of myself, I still listened to a crap-load of great new music throughout the year without really trying, and that's probably as big a testament to this year's sonic strength as there is. One thing that stands out to me now, looking back on the below selections, is that I think we're right where we should be for the middle of a decade. I mean, this music sounds like the middle of a decade, doesn't it? We seem to have arrived at a confident and distinct point in our music; there's a sort of greater, electronic-aided, clean, high-energy and not-scared-of-pop characteristic to be found throughout this year's best releases. A little backstory as to how I came to this thought: The other day, I was waiting in line for tacos behind some teenagers who were going on and on about how much they love mid-'00s music, which, aside from making me feel way old, got me thinking about today's music in that same context. And, for the first time in a long time, I think this year's music can be considered with that same kind of sweeping generalization. That's a good thing, too. I think? Sure, let's go with that. Best Album Released In 2014 That Got No Year-End Love Then Because It Wasn't Released Until Mid-December After Most 2014 Lists Came Out. Old Album I Listened To The Most This Year (As Has Been The Case For About 10 Years Running Now, Seriously More People Need To Know This Album). Album I Was Most Hyped Up About For A Week Before I Completely Forgot About It. Album That The Poptimist In Me Wanted To Love But Just Thought Was OK And Not Really Worth The Hype And I Really Don't Get Where You Guys Are Coming From Unless You All Sit Around Secretly Listening To Radio Disney All Day Or Something. Two Albums I Only Really Like When I Should Be Cut Off From The Bar. The 30 Albums I Liked Best In 2015, Presumably Listed In Some Sort Of Order, Although If You Were To Ask Me To Order Them This Way Again, I Might Come Close But I Almost Certainly Wouldn't Get It Exactly Right. Every year, there seems to be an album or two that are kind of transcendent in the sense that, no matter how sheltered a person is or in what direction his/her musical taste typically leans, everyone seems to agree upon. Kendrick's Thundercat-filled To Pimp a Butterfly masterpiece is definitely one of those albums. To a much lesser extent, the same can almost be said for folks like Courtney Barnett and Tame Impala.